The Fellowes Galaxy E Electric Plastic Comb Binding Machine is designed for the frequent binding needs of a large office. This machine is designed to help combine high performance with the convenience of electric punching. This heavy duty machine can easily punch up to 25 sheets of 20lb bond paper at a time and can bind up to 425 sheets with a 2" comb. The Galaxy E utilizes a vertical document loading slot that helps to ensure accurate punching alignment. The Fellowes Galaxy E also includes a unique removable comb opener binding mechanism that can be used separately for increased productivity. This machine features a built-in comb storage tray with integrated document measurement device for added convenience and quick set-up. Plus, it has an adjustable rotary edge guide to assist in centering your documents for punching. The Galaxy E even features a front-access waste tray for easy, mess-free waste disposal and includes a binding starter pack to help you get started in binding your documents. Punches up to 25 sheets at a time with a minimum of effort. I just tried to bind less than 100 pages. This machine does not work. Worked great for 3.5 years then quit. Still better than the previous machine whose yearly repair contract cost 2x as much as the cost to purchase this binding machine. This comb binding machine is very easy to operate. This product is indeed a life saver! It saves you a lot of time. The instructions are very easy to use. I love using this product. Our office went from a manual punch to an electric one, and it’s the vest decision ever. I was pleasantly surprised at how well the machine works and is built. I was worried that it would be made of plastic and not hold up to the daily demand that we have of it. We have been using it for 4 weeks now and it is a great machine, it is quiet easy to use and works perfectly!!!. I would highly recommend this machine. So happy we've purchased this electric binding machine. We had a manual one, and this is by far so easy and efficient to use. Would definitely recommend to others. Our previous binding machine was from a different manufacturer. It always worked, but when it broke, I shopped around for its replacement. We found the Galaxy E500 and it looked sturdy enough to handle the kind of use our office would give it. It has far exceeded our expectations. On a comparable product, many of the parts were plastic. This machine is attractive, is easier to use than the "other" machine we had, looks nice and has the ability to remove the binding unit for efficiency to bind and punch at the same time. Makes my job easier and more enjoyable to complete. I love my new binding machine. I would highly recommend it to other offices over and over. Transcript: Welcome to MyBinding video. Today we're looking at the Fellowes Galaxy E, an electric plastic comb binding system. Let's take a look at and review the features of the Galaxy E.
Welcome to MyBinding video. Today we're looking at the Fellowes Galaxy E, an electric plastic comb binding system. Let's take a look at and review the features of the Galaxy E.
Like the entire line of Fellowes plastic comb binding machines, this machine offers a contemporary ergonomic design. The Galaxy E folds closed when not in use, allowing it to provide a neat and tidy appearance for your office. Buttons and knobs are intuitive, helpful, and right within reach. And it works well with A4, A5, letter, and cover size documents. Lift the lid and the rest of the features are in plain sight. A great selling feature of the Galaxy E is the removable binding tray. This allows two people to work on the same set of projects simultaneously, one to punch and one to bind. The E of Galaxy E is electric, and this is a great selling point. Using standard 20lb paper weight, this machine can punch 25 sheets at a time. This really can allow you to get through larger projects in a hurry. On comb selection, the Galaxy E has a built-in comb selection guide. Right in the front of the machine is a comb storage tray. Built into that are cut outs in which you can measure the size comb you need. You simply slide your entire project into the holes to see which size comb best fits your project. The comb opener mechanism is easy to use and fluid. There's a punch guide along the front which allows you to assure you're punching things consistently, as well as the side margin control knob. And for added convenience, there are step-by-step directions on how to punch and bind a book printed on the inside of the lid. In terms of weaknesses, there are a couple. Although the Galaxy E has a great punching capacity and an electric punch, it is not an industrial grade machine. It is designed for the office environment. Users who need a production quality machine should consider a much larger, all metal machine with industrial-grade punching pins. The Galaxy E is limited in its ability to punch custom length documents and legal size sheets. And finally, the side margin control dial is workable, but flimsy. It takes a few trial and errors to get it down. Overall, we love the Fellowes Galaxy E 500 machine. And for under 500 dollars, this would be a great bet if it fits your environment. For more demos and reviews of this product and many more, check out MyBinding.com. The Fellowes Galaxy-E is the largest electric binding machine offered by Fellowes. It is designed for frequent use in medium and large sized offices. This machine offers an ergonomic design that is intended to blend in with other equipment inside of your office. It is the electric version of the Fellowes Galaxy manual plastic comb binding machine and it includes a high quality button activated electric punch and a heavy duty modular plastic comb opener. Here are some of the strengths and weaknesses of the Fellowes Galaxy-E comb binding machine. The Galaxy-E offers an electric punch that can punch up to twenty five sheets of 20# paper at a time. The electric punching mechanism is activated by a push button control on the right side of the machine and is exceptionally easy to use. With a punching capacity of 25 sheets, this machine is comparable to far more expensive electric binding punches on the market. 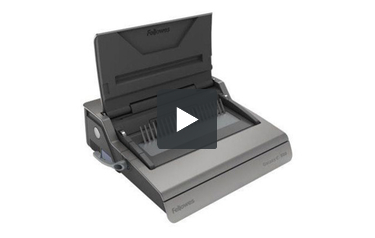 Like the entire line of Fellowes plastic comb binding machines, this machine offers a contemporary ergonomic design. the Galaxy-E folds closed when it is not in use. This allows it to provide a neat and tidy appearance for your office. Most other electric plastic comb binding machines on the market have an industrial look that tends to stick out in a contemporary office environment. The comb opening device included on this machine is removable. This means that you can use the comb opener while it is attached to the machine or it can be removed and used by a second operator to help increase productivity. One user can punch documents while another uses the comb opener to insert the pages onto the combs. This machine has a storage tray that slides out of the right hand side of the machine. The storage tray provides a document sizing guide that allows users to select the correct size of spine for their documents. Although the Galaxy E has a great punching capacity and an electric punch it is not an industrial grade machine. This machine is designed for use within an office environment. Users who need a production quality machine should consider a larger all metal machine such as the GBC CombBind C800pro, Akiles CombMac 24E or DFG E Titan Comb. The larger alternatives offer metal construction, foot pedal operation and industrial grade punching pins. This machine is limited in its ability to punch custom length documents and legal sized sheets. Users who need to bind document sizes other than half letter size, letter size or A4 size should really consider a machine with fully disengageable punching pins. Although the storage tray on the Galaxy-E seems like it should be incredibly useful, it is actually too small to be useful. Most users will find that the storage tray is only large enough to hold a handful of combs. Considering the capacity of this machine, it would probably have been better for Fellowes to simply leave this feature off when they designed this machine. The Fellowes Galaxy E electric comb binding machine is an excellent choice for organizations that are looking for a high quality electric comb binding machine for their office. This machine has a selling price of around $500 and includes a competitive set of features that make it an appealing choice in its class. Extremely large offices, print shops, mail rooms and schools who do a lot of binding will probably find that this machine is too small for their needs. Instead, they should really consider a heavy duty, all metal, commercial grade comb binding machine. However, these machines come with a pricetag starting at about $1400 and are obviously a big step up in terms of cost. Still, this is one of our favorite electric desktop comb binding machines for the money and is definitely a good choice for many users. Dimensions 6.5" x 19.62" x 17.75" 6.5" x 21" x 17.75" 5.12" x 16.87" x 15.37" 5.12" x 18.12" x 15.37"
Can you adjust the depth of the punched holes? Thank you for your question. The Fellowes Galaxy E Electric Plastic Comb Binding Machine has 2 options for the depth of margin. It can be set at either 2.5mm or 4.5mm. What is the largest size document the Fellowes Galaxy E Electric Plastic Comb Binding Machine can bind? Thank you for your question. The Fellowes Galaxy E Electric Plastic Comb Binding Machine can use combs up to 2" . The maximum capacity of 425 sheets of 20# paper. ( the info stating that a 2" comb on this page is incorrect and being updated). Does this machine use a power cord or batteries?? Thank you for your question. 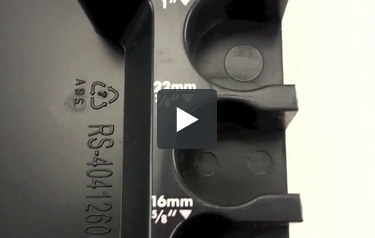 The Fellowes Galaxy E Electric Plastic Comb Binding Machine plugs in to standard power outlet. Does this machine come with a WARRANTY? If so, what is it? The Fellowes Galaxy E Electric Plastic Comb Binding Machine comes with a 2 year manufacturers warranty.